The most devastating factor for slope failures is rainfall infiltration. Surficial slope failures in residual soil slopes are a common sight. In general, slope angles vary considerably from being flat to steep in natural conditions, which govern the hydrological regime of the slope. Further, different types of soils behave differently under rainfall condition in terms of rainfall infiltration and the associated changes in their mechanical behaviour, particularly under different slope inclinations. 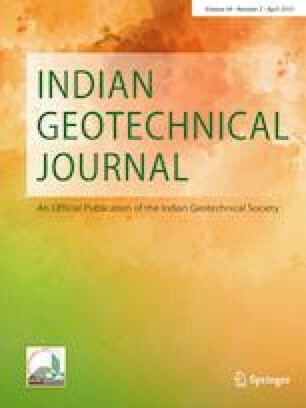 This paper presents a study on the effect of slope inclination on stability of different soil slopes under rainfall conditions. Two-dimensional numerical models were prepared with three different soils having different hydraulic and mechanical properties to investigate the stability of the unsaturated soil slopes. Seepage analysis is performed in the finite element framework, and stability analysis for the slopes is performed in limit equilibrium framework using numerical package SLIDE. The water table in the slope rises high for flat slopes, which is contrary to levels observed in steep slopes. From the results, it was observed that flat slopes allowed more infiltration leading to the rapid reduction in negative pore pressure thereby decreasing the safety factor. Both the initial factor of safety and minimum factor of safety decreased nonlinearly with slope angle. The critical slip surface becomes shallower (shifts towards the slope surface) with increase in angle of the slope. There was very little influence of slope inclination on the stability for slopes higher than 55°.